Delicate, pendant flowers of Lily-of-the-Valley line up along gracefully arching stems in mid-spring. The white or pink blooms are small and waxy, with a cherished fragrance that is irresistible; if you pull up gently on the stems, you will have lovely, long flower spikes to enjoy in a vase, preferably at nose level. Easily grown, these small plants will take a couple of years to establish and may not flower the first year. But their creeping rhizomes will soon spread rapidly, making an ideal ground cover even under large trees. These hardy perennials thrive in zones 3 through 7, but labor in the South. Plants will keep spreading, so you may want to locate them in a contained area. These hardy perennials thrive in zones 3 through 7, but labor in the South. Plants will keep spreading, so you may want to locate them in a contained area. We ship dormant plants that are kept moist by shredded paper and plastic wrapping. Do not remove this packing material until you are ready to plant. If you must delay planting, the plants can remain in their original packing for 5-7 days. Keep them cool (but above freezing) and out of direct sun. Check for moisture and if dry, add water and pour off the excess. Once you are ready to plant, remove the packing material. Place each pip (the pointed bud that produces new leaves and flowering stalks) in the planting hole about 1 inch below soil level. Spread the roots out around the pip like the spokes of a wheel. After covering with soil, firm lightly and water thoroughly. Space pips about 6in apart. 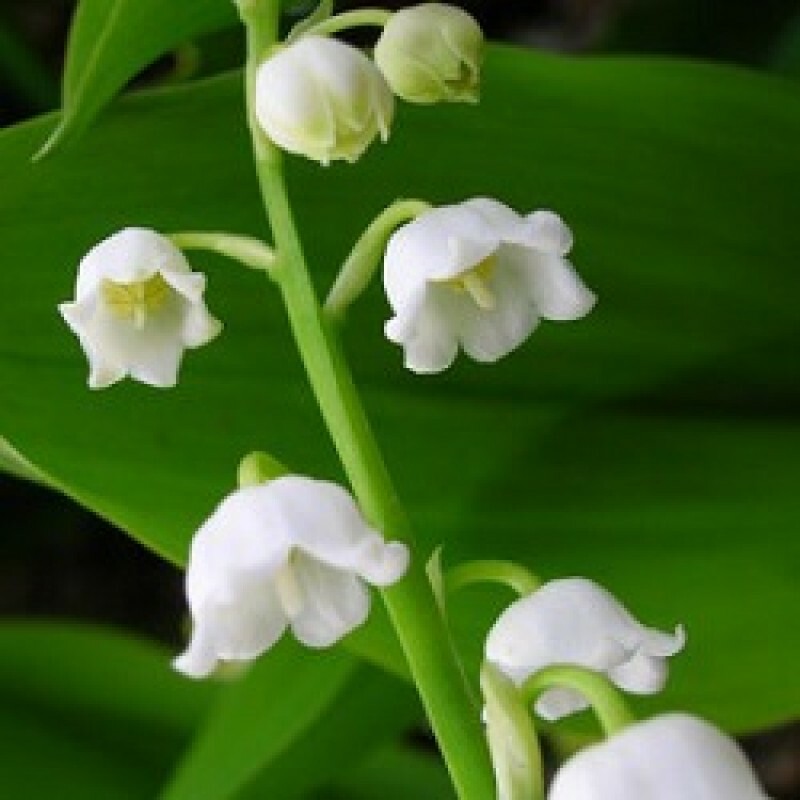 Lily-of-the-Valley relishes well-drained but moist soil and does best in partial shade. It will grow in the sun if soil moisture is consistent, but the foliage may not look its best. These easy-going plants are not particular as to soil conditions, but grow best with a soil rich in humus that is slightly acidic. Feed lightly in spring, and mulch with compost or well-rotted manure in early fall. These plants are generally quite healthy and vigorous. Fungal leaf spotting may occur but is usually minor. Remove any affected foliage and destroy. Occasionally weevils will feed on the leaves, making small notches along the edges, but damage is usually insignificant. A backdrop of deep green Ferns will showcase the snowy white flowers perfectly, while smaller blue- or green-leaved Hostas will provide contrast. Anemone pulsatilla, Anemone sylvestris, and the smaller varieties of Bleeding Hearts (Dicentra) and Columbines (Aquilegia) are lovely herbaceous counterpoints; a planting of Lily-of-the-Valley at the feet of a white-flowered shrub, such as Deutzia gracilis, provides a perfect echo. Leaves may become tattered and unattractive toward the end of the growing season; simply cut back to ground level. If left intact, the deciduous leaves turn a lovely golden hue in the fall, accompanied by colorful (but inedible) orange berries. Lily-of-the-Valley is easily divided when dormant in spring or fall. Simply dig up the small rhizomes (called pips), gently separate, and replant 4in apart; plants will fill in quite quickly. Water well after transplanting. Simply rake up fallen foliage and mulch lightly with well-rotted manure or compost. Water thoroughly if the season is dry. Apply a light application of 10-10-10 fertilizer or side-dress with compost and organic amendments when new growth appears. Supplement nitrogen during periods of prolonged rain to counter natural leaching. Water well if it is unseasonably dry, as plants prefer an evenly moist soil. Divide or transplant if desired. Mulch plants as soil warms to buffer soil moisture and temperature. Pluck the lovely flower stems and bring indoors to enjoy the inimitable fragrance. If fungal leaf spotting is a bother simply cut affected foliage back to ground level. Water during dry periods. Rake up fallen foliage and mulch lightly with compost or well-rotted manure. Plants may be divided or transplanted now; simply dig up clumps, gently separate rhizomes and replant. Water well.